Ever wanted to label a layer in ArcGlobe? The recently updated “ArcGlobe Text Toolbar” allows an ArcGlobe user to label any FeatureLayer with true 3D text. Labels are transparently persisted to an external GLM file (eg myGlobeDocument.glm). 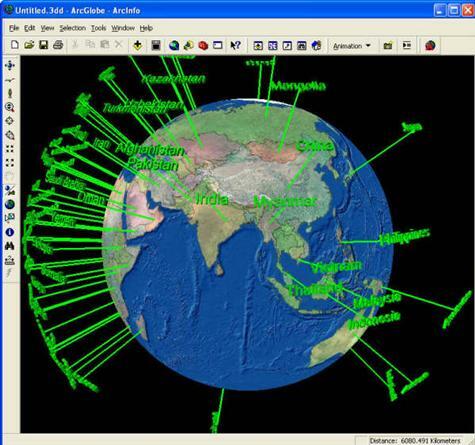 The toolbar also extends the ArcGlobe animation framework. Text can be animated over time and space. Other properties such as color and azimuth can also be animated. I think ArcGlobe has been ignored over the years for many reasons (some valid, others aren’t), but now with Google Earth taking off, many GIS professionals are taking a second look at ArcGlobe especially since ArcReader 9.2 9.1 will support Globe documents removing the requirement for ArcView or greater. I wish I had a better laptop than I did because I can’t really run ArcGlobe well with this really poor video card.